The answer is simply YES! Since our involvement in themed environments for facilities all around the world, we have seen hands down that those that stand the test of time are the ones that offer that extra level of fantasy while engaging their customer’s imagination. This prevails any misconception that theming is overrated, too expensive or simply a waste of money. This extra investment provides a stronger return on investment as they hold their value and your customer’s interest over a longer period of time. Theming is where reality stops and fantasy begins. What would theme parks be with out their high-quality themed environments? What would your business be with one? Themed Environments are exact replicas of geological landforms, buildings, structures and murals that duplicate a particular region or landscape. Whether your dream is as basic as an enchanted whimsical playhouse for your kids or as elaborate as transforming your eatery from adequate to extraordinary - we can do it. Themed environments can be based upon a specific time in history such as medieval times, a region or landmark like the African planes or the Moulin Rouge or, how about a particular setting such as an underwater reef or a tropical rainforest? What Does Artistic Contractors Do? We work through all the logistics in transforming your creative concept into three-dimensional reality. Once a creative concept is agreed upon, a review process is conducted to best convey a clear picture of the project. Then our experienced “artistic contractors” utilize the latest fabrication methods as well as techniques perfected by the old masters to bring it to life. We would love to help you design your own unique facility including design, manufacture and install a complete turn key operation. Who Does Artistic Contractors Serve? 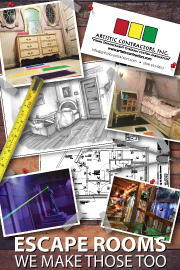 Our experienced “artistic contractors” specialize in design and fabrication of highly crafted themed environments for theme parks, zoos, malls, museums, retail stores, night clubs, restaurants, medical facilities, corporate and residential decor. Where would I see themed environments? Theme parks have created highly themed areas within their parks that allow patrons a variety of immersive experiences all within the park’s gates. Now it’s your turn! Is Theming A Good Investment? Every business is dependant on its customers and their customer’s willingness to visit their business, return, and spend money on each visit. We understand that your customers and prospects have choices on the shops and businesses they frequent. Nowadays children are often active participants in their parents shopping, dining, leisure and errand trips. By providing exciting and fun themed indoor “kid friendly” play environments or imaginative outdoor playgrounds for kids, we provide the "tools" to make locations more "family friendly", so that parents can spend more time shopping, or just sitting back and watching. would choose a competitor over their favorite store if the competitor featured a play area. Businesses that choose children’s play areas as an investment secure a considerable advantage over their competition. These businesses understand there is a direct correlation between offering family friendly play indoor / outdoor play areas and increasing revenues. Consider the impact to your business if families were to choose to spend one more visit per week/month/year. Our mantra is “The work we do is truly the work we love”. Everything we do is focused on producing results for your business including working to prepare solutions to meet your budgets and space. Budgeting for a themed environment will provide results that will take your business to the next level, boost return visitors, and keep the children in all of us entertained with fantasy, imagination and play. Our customers contact Artistic Contractors while searching for a solution that will take their business to the NEXT level and when they are looking for a competitive edge. We are able to succeed by specially designing each environment so it offers just the right amount of theming to attract new and repeat customers. Our designs, with your input, are fashioned to specifically suit your needs as we look at your business over the long term. Your Imagination is the beginning of themed construction. Contact us today!